As opposed to microneedling rollers and pens that can lead to tearing , pain and variable patient results, the vivace needle contains 36 insulated, gold-tipped needles ready to deliver results at 31 depth settings. The robotic step motor- only found in the Vivace- creates fast and even insertions into the skin, and the chevron-pattern circuitry for the 70-watt patterned RF distributes heat evenly as it delivers skin tightening across the face, reducing redness, hot spots, burning and discomfort that can occur with other devices. Red and Blue LED compliments the treatment. Red LED helps stimulate collagen whereas the Blue LED disrupts acne bacteria. 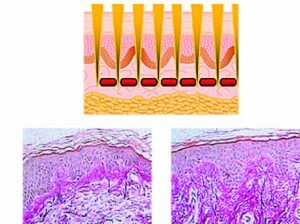 When applied to the skin, under topical anesthesia, sterile microneedles are used to create microscopic channels deep into the dermis of the skin that can stay open up t o four to six hours. This stimulates an individual’s own body to produce new collagen. The precise delivery of RF energy to 31 varying depths of penetration gives The Vivace exceptional outcomes. A specialized treatment serum and a revolutionary peptide mask are applied following treatment to help accelerate recovery and suppress inflammation. elastin and wound contraction, which enhances skin laxity. Pulses of light activate skin cell to increase collagen production and moisture levels in skin, and improve skin tone and texture. You will see immediate results after one treatment but for the most optimal results and benefits we recommend a series of at least three treatments spaced 4-6 weeks apart, with maintenance treatments throughout the year.Special package pricing is available. Each treatment can take up to an hour and possibly longer if multiple areas are being treated. We request you arrive 30 minutes prior to your treatment to apply a topical numbing agent. Your face should remain clean following the treatment since we have created small microchannels that could get clogged with dirt, debris and makeup. We recommend waiting a full day before resuming make up and to avoid certain topical creams such as glycolic and retinoids preceding and following treatment for at 7 days. To learn more and find out if the Vivace Experience is right for you schedule a complimentary consultation with one of our licensed aestheticians.